When teaching the parts of a book, the front cover is the place to start. 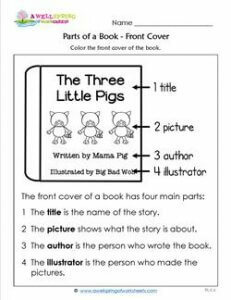 Here’s a great worksheet showing kids the four main things they’ll find on the front cover – the title, a picture, the author’s name and the illustrator’s name. You can follow this worksheet up with this one where our kids will get practice writing these four words.